It was Cam’s 5th birthday and we were going to have a meal of kid favorites – chicken nuggets, Mexican rice, and cupcakes. 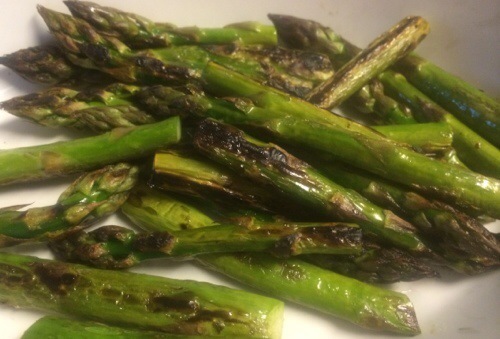 For my husband and I, it just was not going to be satisfying, so I added charred asparagus to the menu. Asparagus is one of the few green vegetables Cam will not eat, but it is in season and we love it. Still can’t get enough of it. 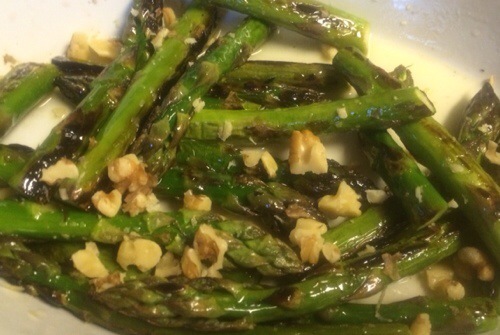 I have had walnut oil waiting for a good use, so the asparagus was tossed with walnut oil, lemon juice, salt and then sprinkled with some chopped walnuts. Yum!! We actually both finished off the asparagus before I even began plating the rest of the food. Heat a large heavy skillet (not non-stick) over high heat for 2 minutes. Coat pan with cooking spray. Immediately add the asparagus in a single layer. Cook, without stirring for 2 minutes, or until lightly charred. Flip the asparagus and cook, tossing occasionally, another 5 minutes, or until crisp-tender and even charred. Remove from pan. Toss with walnut oil, lemon juice and salt. Sprinkle with nuts. Serve immediately and enjoy!